If you are a youtuber then you must be aware about YouTube earnings. If you are a newbie in this field then i must tell you that if you have interest in video making and online working then you should go with YouTube and websites and you should check the basic requirements of adsense and YouTube. As when i came to this field, i was thinking that money earning will be easy and i will earn lakhs of rupees easily, yes we make money but it takes a deep research and at first it takes lots of efforts. Online money earning is tough now a days but not impossible and once you are all set with your research, you will earn a lot but you have to spent a lot of time on Internet to do so. This is all because everyone now a days wants to earn money via YouTube and websites and as more competitors means more work and more research. Without research it’s very tough to rank your YouTube channel and videos. Because rank of your channel depends upon some factors and one of them is traffic via Google or via other search engines. Almost 30% of the traffic is drived from Google and 50-60% by YouTube and rest by searching on YouTube. So without proper information your video may not be in top 10 videos of same niche or yopic. Due to this you may not get maximum traffic by YouTube searches or by google. So if you are new in this field, i will suggest you to do proper research on all this and note all the similar points on different websites which you will find during your research and apply all of them on your YouTube channel and videos but do apply one thing today and another thing after a Few days, so that you can analyze the things and changes to your videos. Note down those things which will work for you and apply those things to all your youtube videos. But for me these things happened to be miraculous and these are. Choose your channel name according to your niche or topic. Choosing a right and low competitive channel name will help you to rank quickly in YouTube. For example If you are gonna provide tutorials about YouTube then your channel name should be like “YouTube tutorials” or something like this. You also have to keep in mind about competition of channel name. A unique channel name will help you to make your channel as a brand, but it will take some time and hardwork. So you must be aware about how to create a new YouTube channel if not then you can read how to create a new YouTube channel. Try to upload videos on unique topics or niches. When you will upload videos on unique topics your videos will be ranked easily in YouTube. So whenever anyone searches about that topic, your video will be listed on the top of the search results and probably you will get more views on your videos. Select one of your videos as featured video. * Click on gear icon on the left hand side. * Click on my channel, now click on video manager. * Now again click on gear icon which will be below the first gear icon on the top right corner of your left side. * Now click on channel. * After that click on featured video. * Select your best video or trending/demanded video and you are done. Use a small pic as your branding mark. * Now click on branding. * Add a picture or image which you want to set as your branding mark. * Save the settings and you are done. Whenever you make a new video on any topic, try to provide sufficient information on that and not to go beyond your topic as providing what people are actually try to search or what people are interested in will help you to get more and more views on your YouTube videos. If you will go beyond the selected topic, then viewers may get bored or may feel that your video is not so good to watch it full and you must understand that there are many other videos and YouTube channels like you have and people don’t want to waste their time. So make your videos point to point and don’t go beyond the selected topic. To get more views on YouTube: try to engage your audience. YouTube loves those videos and YouTube channels which try to engage their audience in their videos by many ways like adding polls to your videos or by encouraging your viewers to share their feedback in comments box. Engaging your will help you to get more views on your videos but mainly will increase ranking of your videos and channel. Ranking is directly related to views as YouTube search engine shows the top ranking videos in search results, in this way you can get more and more views. Make your video titles seo friendly, To get your videos good YouTube ranking. As i said above good ranking is directly related to more views on your YouTube videos. So in order to get more views on your videos, make your video titles seo friendly. You can make your video titles Seo friendly by these points. ==> Make your video title compact, don’t make it too lengthy nor do short. ===> Include your keyword in your videos title. ===> Avoid using non useful words in your videos title. Write description of almost 300 words, to get more views on your videos. When you write a description of about 300 words with your primary and secondary keywords spreaded suitably, search engines like Google can search it easily and be shown in the first page of Google and certainly you will get some more views to your videos. Whenever anyone tries to search anything in Google, Google shows him relevant results and if you will provide a 300 words long description with your videos.google will find it like a bread wit butter. Use less number Of tags, to get optimized well in search engines. If you will use two to there tags in your videos then it will be easy for YouTube to understand on what niche your video is and YouTube will show your videos of optimized well on the very first page of search results. If you will provide more number of tags, it may be confusing for YouTube to understand in which niche your video is, this may happen because of non relevancy of your tags. So it is better to add two to three tags with a good title. You can use tags to your videos by following these steps. ==> First three steps are same as in tip no. 3. * Click on edit in front of that video in which you want to add tags. * Now there will be almost 5 options, click on tags. * Now add tags and save, you are done. Use custom thumbnail with its name as your keyword, to increases your YouTube ranking. Using custom thumbnail will be only helpful if it’s name is that which is your keyword or on which you have made your video, for example if you made a video on “proper seo for YouTube” then custom thumbnails name/title should be “seo for YouTube” and you can change that name in your file manager. * Now click on edit. *There will be an option called custom thumbnails below the already three available thimbnails. *Click on it and upload your desired thumbnail. * Save it and you are done. Use cards of your related videos, in order to get more views on your YouTube videos. While watching a video on laptop or on your phone, You must have seen a suggested video title coming on the top right side of your screen as shown in image below like “suggested: watch how to get adsense account approved within a day by google” and these are known as cards. If viewers find your cards good they will click on them and in this way they will also watch your other videos and you will be able to get more views to your videos. Also You cannot add more than 5 cards in a video. * Now click on edit video, which is in front of every video. * There will be 5 options among which there will be one option of cards. * Click on it, and select timing of video by dragging the timer of video to the desired position. * Now add a card and select a video which you want to be shown in your video. * Save all the changes and you are done. Schedule your upload time. Scheduling your video upload time helps you to gain more and more subscribers. Subscribers has direct impact on views of your videos. You may have seen too YouTube channels has a large number of subscribers and whenever they upload a video those subscribers are been notified by YouTube and they view that video and the owner of that channel gets views on his YouTube video without doing anything. The best schedule is to upload one video daily but it may be tough for tech related YouTube channel owners to upload one video daily. So they can upload a video after a gap of two days by doing this if anyone will watch one of your videos he will be having all your videos in next to watch list which means if one of your video gets a large number of views, rest of the videos will get views automatically. Encourage your viewers to subscribe your channel to increase your subscriber count. When you will make a video on anything, you should tell your viewers to subscribe your channel. You can do that by many ways like by adding your voice to your video in which you will encourage your viewers to subscribe our channel so that you will be notified when we will upload a new video on the next topic. You can also encourage your viewers by adding text message of subscribe our channel to your video. If you are new in all this, you must be thinking why are subscribers so much important? I already said that in the tip no. 12 that is views are related to subscribers. Promote your videos on social sites To get initial views on your YouTube videos. 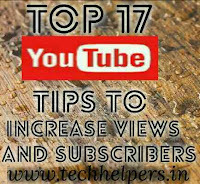 If you don’t have a large number of subscribers then It is very important to give a boost of views to your videos by sharing them on social sites like facebook, Twitter etc. If you don’t share your videos on social sites then you may not get your first view of your video for a long time. This happens because whenever any one tries to search a video on YouTube, he don’t want to watch a video which doesn’t have a single view. It is a common response of almost every viewer. 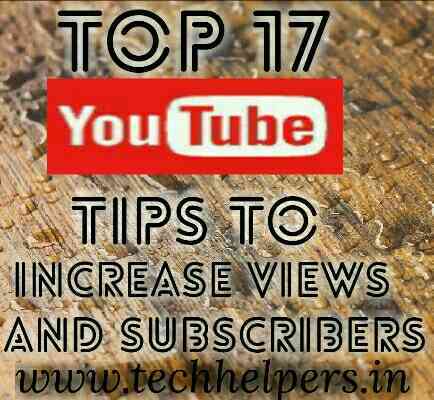 Make few videos on trending topics to get millions of views. If you are a new youtuber then you may not get views on your videos for a long time, in that case you can make a video on any trending topic and you will get a lot of views on your rest of the videos because of that trending video. To search what is trending, you use Google to search or you can use Twitter to see what’s trending?. Trending topics change time by time but trending videos get millions of views in less than a day. Whenever anyone will watch your trending video he/she will be shown a message “more from this channel” if he/she clicks on it he will watch your rest of the videos and by making a video on any trending topic, you will get more subscribers. Moreover you can download any trending video and can upload that but you shouldn’t monetize that. If you will monetize that you will be banned by YouTube for a month and remember after downloading that video, you should first upload that video by any other channel, so that if the owner of that video will file an appeal or not? In his way you will be able to know whether your channel will have to face any panelty or not by uploading that video. For that you should be aware about basic YouTube penalties. Allow other videos to be shown with your videos to get some views. By allowing other videos to be shown with your videos, your videos will also be shown with other YouTube videos. Let us say “A” has a tech related channel and he has a video on recover your data and “B” also has a YouTube channel on technology and he has a video on recover deleted data. If these two allow other videos to be shown with their videos then if somebody is watching recover deleted data video of ‘B’ then ‘A’s recover deleted data video will be shown with B’s video and vice versa. Make a playlist of your videos. By making a playlist if anyone will click on that playlist he/she can watch all of your videos without having options of watching others youtubers videos of related video to that which he was watching and you should try to make a playlist of related videos like if you have 3-4 videos of recover deleted data without pc or of reliance jio 4G then you should make a playlist of these three videos so that if anyone is searching for that particular topic, he/she can click on that playlist and can watch those 3-4 videos but if those 3-4 videos are not of the same topic he/she will not watch that or will not find your playlist good. you can also add one YouTube video of any other youtuber to your playlist which is very hit or has many views. By this way he is getting many views, you can also get some views. Before doing all this you should be aware about the basic requirements of YouTube and adsense and video monetization in youtube. I haven't gotten to creating a youtube channel. I have an account and the only videos I have in there are personal ones, like family reunions, school events, etc. I will bookmark this post for reference if and when I decide it is time to utilize youtube to bring more viewership to my blog. YouTube has definitely come up in leaps and bounds in the last few years. Seems to have spawned quite a few Internet millionaires pretty quickly. A lot faster than blogging because of the instant credibility. i really want to start making youtube videos and this was helpful! Wow these are some really great tips for establishing a viewership on Youtube. I use mine mostly as a complementary to my blog but definitely want to implement some of these tips. I'm not so active on youtube lately, but I always liked vlogging – with these tips I'm sure I could become more successful once I pick it up again!